We recently talked about the wonders of substituting your normally cooked meal for a charcuterie plate. It’s easy, but more importantly, it’s delicious and elegant. Open a nice bottle of red wine, eat slowly, and marvel at the flavors and combinations of meat, cheese, fruit and bread. Because we’ve enjoyed eating in this fashion so much recently, we think it’s only fair to really beat you over the head with this topic on the blog. Below the picture, you’ll find a link for a general charcuterie page – our ideas and thoughts on putting together a good charcuterie plate and some ways you can make it more frugal. Please leave your comments – what is your ideal charcuterie plate? Do you know of some good sources for great products? Speaking of the picture, what is that big grey mass on the plate? 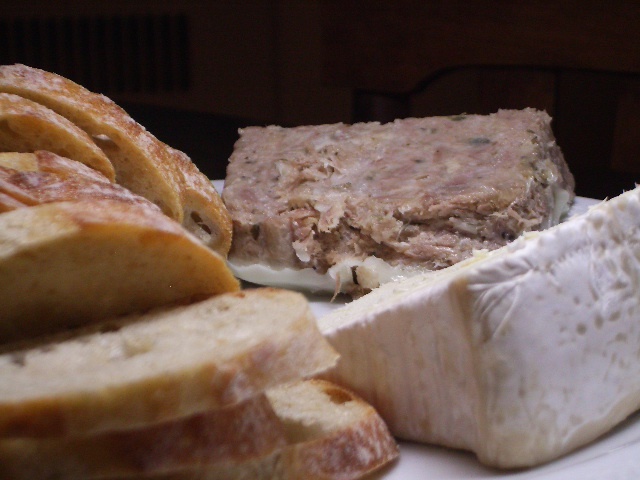 It’s the most delicious thing you’ve ever/never tasted: Rillettes. It’s sort of like French pulled pork – cooked slowly, with herbs and seasoning and in its own fat. You cook it until it’s almost mush, but not like pate. Then, it’s spreadable on bread and delicious with cheese and other things. We’ve had rabbit rillettes before, and loved that too. The picture below won’t win us any foodblog picture contests – where’s the color contrast? Don’t you need something fresh to go along with that heavy meat and triple cream French cheese? No. It was delicious and I wouldn’t change a thing. By the way- We bought the rillettes in the picture, we didn’t make it. Hopefully, sometime soon, we’ll make it and post the recipe. For now, here’s the recipe: 1. Go to your butcher or the nice lady at the farmer’s market who prepares French food. 2. Buy Rillettes. 3. Take it home, open a good bottle of wine, and ENJOY! Hey Mary Nelson! We found the pork rillettes in Williamsburg at the Farmer’s Market- there’s a fantastic booth there with good prepared French food. As for rillettes in Richmond, Belmont Butchery is definitely the place to go. Apparently they don’t normally carry it in stock, but if you let them know you want some, they’ll make it. We also had their rabbit rillettes, which was incredible.